About two weeks ago, I read about a fun website on Z Recommends, one of my favorite parenting blogs. The Toy Maker is full of downloadable PDF files for paper toys. We tried making the magic wand and fuschia box. Each toy takes a certain amount of fine motor skills, thus they are not appropriate for little children or arthritic hands. I would recommend these projects for children older than 10, if you expect them to participate in the construction. Otherwise, younger children are amazed at your talents when you construct one of these toys for them. I recommend printing on recycled card stock, as regular paper is too flimsy. 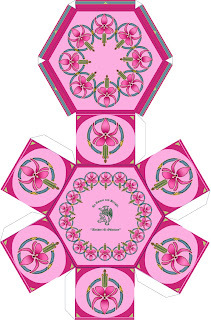 Our fuschia box has a tilt to it from using regular computer paper. In addition, for many projects you need to know the difference between a mountain and valley fold. I love to make handmade books, so I was familiar with these terms. A mountain fold creates a mountain peak shape; a valley fold creates a “v” shape (perhaps it should really be called a gorge fold, as a geographical valley is not usually so narrow). As Z Recs writes, this site is useful for “a quick and easy new toy to help turn a tough day around.” This would be a very useful site for babysitters! Below, I’ve included Amazon products by my favorite author on paper arts Shereen LaPlantz and the Toy Maker’s book.